Climate science. Climate science features highly in my laundry list of reasons for why I no longer consider myself a libertarian. You couldn’t swing a dead cat in libertarian gatherings without hitting a conspiracy fantasist or a climate denier when I left the Libertarian Party in 2008. I find the phrase knows just enough to be dangerous to be quite apt when it comes to most things climate science. This applies even more strongly to those within the scientific fields than it does to the man on the street who is just trying to get by in life working three jobs and sharing an apartment with 3 other people. The video (and transcript) below were shared by a friend the other day. I tuned out of watching the video when I realized that the article beneath it was just a transcript of the video presentation. The fact that my friend didn’t believe in anthropogenic climate change the last time I checked influenced my dismissal of the video as Not. Real. Science. There was also the looming risk of being sucked into another conspiracy fantasy to factor into the weight I would give any data found within the article. Everyone has a bias. Especially people who disagree with science. My friend insisted that I had to watch the video or at least read the transcript, so I bit the bullet and watched. I’m not making any promises on producing insights that would be accepted by anyone who would deny climate changes, the determinable causes of climate changing, but I’ll give it my best shot. There is a transcript available at this link. First off, if I had realized that the video was from the GWPF I would have been a little slower to dismiss it. I don’t write about climate change on this blog very much because, quite frankly, I’m one of the dangerous people. I know just enough about the subject to get myself into trouble and can be (demonstrably have been with other subjects) lead down rabbit holes unless I keep my guard up. 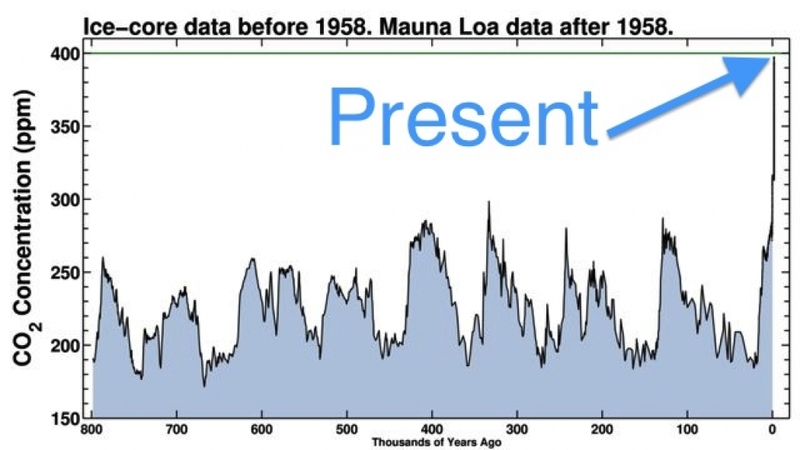 The carbon dioxide (CO2) content of the atmosphere has varied cyclically between ~180 and ~280 parts per million by volume over the past 800,000 years, closely coupled with temperature and sea level. For earlier periods in Earth’s history, the partial pressure of CO2 (pCO2) is much less certain, and the relation between pCO2 and climate remains poorly constrained. We use boron/calcium ratios in foraminifera to estimate pCO2 during major climate transitions of the past 20 million years. During the Middle Miocene, when temperatures were ~3° to 6°C warmer and sea level was 25 to 40 meters higher than at present, pCO2 appears to have been similar to modern levels. Decreases in pCO2 were apparently synchronous with major episodes of glacial expansion during the Middle Miocene (~14 to 10 million years ago) and Late Pliocene (~3.3 to 2.4 million years ago). I added bold to the important sentence in those findings. If you need help converting meters to feet, it’s about 3 feet to 1 meter. About floor 9 of a beachfront Miami condo for those still not getting the impact of sea level changes in our modern world. Manhattan will eventually be right on the water, which will mean it will take quite a trick to keep water out of those subways in the future. Well, that is a no-brainer. I was reading books like ICE when I was in my teens. I was well aware that we were supposed to be caught up in a returning ice age by the time we got to 2000, according to the doom & gloom types, as the speaker goes into in the video (this is a myth, just FYI. A myth that I believed) I never bought into Al Gore’s propositions of global disaster from global warming; but the science is pretty solid as I noted above, and it is just the models which fail to predict outcomes in any meaningful way. Trees in the Eastern United States are growing faster than they have in the last two centuries in response to Earth’s warming climate, a new study finds. For more than 20 years forest ecologist Geoffrey Parker, based at the Smithsonian Environmental Research Center outside Washington, D.C., has tracked the growth of 55 stands of mixed hardwood forest plots in Maryland. Parker’s tree censuses over this period have revealed that these forested areas are packing on weight at a much faster rate than expected; on average, the forests are growing an additional 2 tons per acre annually. That works out to the equivalent of a tree with a diameter of 2 feet (0.6 m) sprouting up over a year. Recent research has revealed that trees across the world continue to grow significantly faster than they did before the 1960s, but what’s the cause? Experts from Technische Universität München (TUM) provide evidence and speculation about this mysterious phenomenon in a recent study. The study, published in the journal Nature Communications, details how the rate of tree growth, particularly in Central Europe, has increased by up to 70 percent over the last few decades. These findings were based on an analysis of long term data from experimental forest plots that have been in observation since 1870. The plots of forest were designed to serve as a representation for average soil and climate conditions throughout Central Europe. Earlier this month, NASA scientists provided a visualization of a startling climate change trend — the Earth is getting greener, as viewed from space, especially in its rapidly warming northern regions. And this is presumably occurring as more carbon dioxide in the air, along with warmer temperatures and longer growing seasons, makes plants very, very happy. Now, new research in Nature Climate Change not only reinforces the reality of this trend — which is already provoking debate about the overall climate consequences of a warming Arctic — but statistically attributes it to human causes, which largely means greenhouse gas emissions (albeit with a mix of other elements as well). The roughly three-decade greening trend itself is apparent, the study notes, in satellite images of “leaf area index” — defined as “the amount of leaf area per ground area,” as Robert Buitenwerf of Aaarhus University in Denmark explains in a commentary accompanying the study — across most of the northern hemisphere outside of the tropics, a region sometimes defined as the “extratropics.” Granted, there are a few patches in Alaska, Canada and Eurasia where greening has not been seen. Before being pestered into watching the full video, commenting on the full transcript. The greening argument is old news for me. I’ve already looked into it. It is an interesting development. Its full impact is still unknown. What I found most interesting in the talk was Matt Ridley’s note that most dire projections are based on RCP 8.5. I can agree with him on the lunacy of projecting based on this worst-case-scenario outcome. It just makes you look foolish when your predictions turn out to be so incredibly wrong. Then he goes off the reservation and never returns. No renewable energy subsidies? Fine. You first. Get the entirety of the rest of the fossil fuels industry to give up their subsidies and we’ll talk. Worse than being disinterested on the subject of Global Warming or Climate Change (which ever label you prefer) Matt Ridley is invested in coal. Lives and dies by demand for coal. I suggest, as I have about a dozen times, that we either remove subsidies from all ventures, or encourage all sound ventures with subsidies. Sound ventures. That doesn’t me we subsidize ethanol, which I have never understood being considered a green product. However, creation of wind farms across the windier areas of the world, and solar cells on every rooftop that gets moderate sun are completely reasonable propositions and should be subsidized if other forms of energy production are subsidized. I can generate electricity and to spare with solar cells on my roof, and that includes charging my electric car. That is a benefit to me and the planet in general. He also never mentions that while sea level rise isn’t as bad as projected, any rise in sea levels produces larger disasters than we’ve seen in the past, as both hurricane Sandy and Katrina demonstrated. I’m still betting we are surfing through the ruins of Miami long before the arguments about climate change are settled, and I’m willing to bet the current residents of Miami would find that outcome pretty disastrous. For what it’s worth, The next to last video loaded on the GWPF stream is the one I find most relevant. This is the problem with modern science. Findings are reported as if they are science by most journalists, when the complete opposite is the case, as the short video goes into. Findings are not science. Findings are discoveries. Duplication of findings is science, the drudge work of science that far too few people show any interest in doing, to the detriment of us all. With time comes addendum and additional information. After watching the GWPF feed for awhile and tracking the general tone of their reportage, I have to agree with the assessment of others who dismiss them as a nexus of science denial. The name of the group itself screams of astroturfing and their latest video goes out of its way to defend Breitbart and their unapologetic science denial on the subject of global warming. I was really hoping for a group that I could rely on for reportage that wasn’t gloom and doom on the climate change front, but the GWPF doesn’t appear to be that group. This episode of Inquiring Minds fits the hopeful bill pretty well. Even in the face of the triumph of climate deniers and outright economic criminals (the looming election of the OHM) the astrobiologist David Grinspoon sounds a hopeful note for the future, pointing out that we are already moving in new directions climate-wise with or without our governments attempts to influence our behavior.